It’s obvious to eat when you are hungry, sleep when you are sleepy and pause to state your goal when you lack direction. 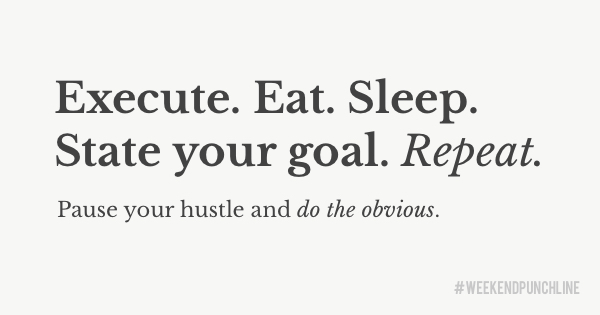 Do the obvious when you hustle, tinker and act. So, when you’re in execution mode there are only 3 variables to consider and take care of: sleep, hunger and direction. Execute until you lack at least one of them. Then stop the execution and give your body and mind what it is asking for. You’re tired? Sleep (or nap). Lacking direction? State your goal. Execution can include social interaction but it can also be sole focused (deep) work. It’s ok to push through a feeling of hunger, sleepiness and missing direction, but don’t overstretch it. When you don’t eat well on a regular basis, your energy level will suffer. When you’re executing with lack of sleep too often, your concentration will suffer. When you execute with no sense of direction, you will just be acting like a blind-folded or drunk person. Every step you make in a condition of lack can cause you trouble for your execution in the long run. Stay healthy and fit during the execution. Execution includes doing sports because execution means to be active and proactive. Practice listening to yourself. Always listen to yourself. This self will guide you. Never lose your head in execution mode. Always be fully conscious about what you are doing. Automation not allowed. Flow explicitly allowed. Execute for a period of time on a specific item. Be in constant dialogue with your self. Have your goal clear. If it’s not clear, restate or specify it. When your motive (goal) is clear and obvious to you, and you take action, you have motivation. You can never run out motivation when you execute with a clear goal. You can terminate hunger with food, sleepiness with sleep and no direction with a clear goal. You have no excuse to not have motivation when your goal is clear and you act towards it. Being lazy is not excuse. Would your 50-year-old version of you be proud of you when you didn’t act in your 20s, 30s and 40s because you preferred to be lazy? If you’re not a role model for yourself, how can you be an idol for others? It all starts with yourself. When you’re good with yourself you can move on to be a great servant for others. First, fix your self. Then help fix others’ selves. Execute. Eat. Sleep. State your goal. Repeat. This was episode 5 of the #weekendpunchline . Every Saturday and Sunday.